Any enthusiast deserves to have a UNIQUE and AWESOME appearance to their Ford F-150. 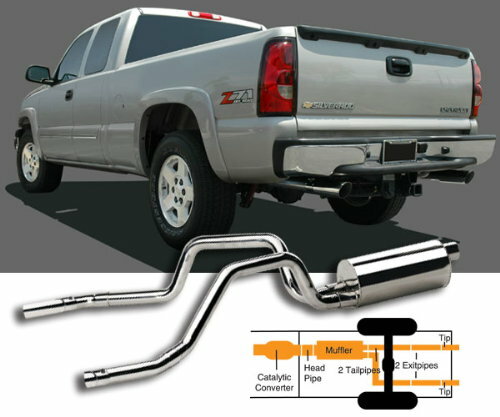 Giving your car an aggressive and powerful sound, this split rear bolt-on cat-back exhaust is the PERFECT match for your vehicle. Gibson's exhaust systems decrease back-pressure, which enables your vehicle to show you what its REALLY MADE OF by increasing horsepower and torque. Typical gains average between 15 - 20 HORSEPOWER. Although the spare tire MAY need to be relocated/removed, this exhaust works with most bumpers, roll pan and trailer hitches! This exhaust is NOT recommended for towing because carbon monoxide may enter the interior rear of a vehicle when the exhaust pipe directly exists to the rear of the vehicle. Keep in mind that your exhaust can be LOUDER under towing conditions.